If there is one category of skin care ingredients you can never have too much of, it’s antioxidants. They intervene to defend your skin against pollution and environmental damage, and work deep down to improve how skin works. We break down the most noteworthy benefits that antioxidants provide and pinpoint the perfect skin care products to deliver them. 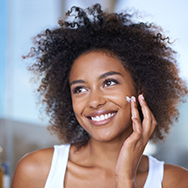 You don’t see it happening, but your skin takes a daily beating from pollution and environmental stressors, which can lead to sagging, wrinkles, and dull skin tone. Abundant research has shown that topically applied antioxidants have a unique ability to intercept this kind of environmental attack and halt accelerated aging in its tracks! Glutathione, superoxide dismutase, and ubiquinone are just a few of many antioxidants that can defend against the visible effects of pollution. Find these and many more pollution-fighting antioxidants in our RESIST Super Antioxidant Concentrate Serum. Over time, the vital substances in skin’s surface become depleted, which causes firmness to decline. A potent blend of antioxidants can step in to help slow this kind of deterioration. The result? Skin regains a firmer look and feel! Look for antioxidant products rich in omega-3 fatty acids such as flaxseed oil and linoleic acid; passion fruit, which is a potent source of omega-6; and almond oil, which delivers omega-9. Omega-centric antioxidants are extremely effective in revitalizing skin’s surface, and when you pair them with the powerhouse antioxidant retinol you get firmer-looking, more resilient skin. Get this potent combination of antioxidants via our RESIST Omega+ Complex and 1% Retinol Booster. Select antioxidants have the unique ability to improve the appearance of dull, uneven skin tone and deliver a more healthy-looking complexion. Vitamin C is one such antioxidant, and it’s particularly effective for brightening skin. Vitamin C comes in many beneficial forms, such as ascorbic acid, tetrahexyldecyl ascorbate, ascorbyl palmitate, and others. For best results and a noticeably brighter complexion, go with a high-concentration vitamin C formula, like our C15 Super Booster. Certain antioxidants double up by also providing significant soothing properties for skin. In particular, antioxidant-rich green tea, chamomile, and beta-glucan stand out for their distinct calming effects to visibly soothe redness. Try our CALM Redness Relief Repairing Serum for an ultra-soothing mix of antioxidants and skin-replenishing ingredients. It's great for sensitive skin, even for those with rosacea. Without question, abundant research shows antioxidants help diminish and visibly soften the appearance of wrinkles. There isn't a singular “best” antioxidant that you need to look for—what counts is that the product you use contains a variety of antioxidants (the more, the better). Explore all of our antioxidant-loaded serums here. Each is packed with a rich assortment of research-backed antioxidants, and there’s a formula that’s suitable for every skin type!